Ramadan is a holy month of fasting, introspection and prayer for Muslims. Each day during Ramadan, Muslims do not eat or drink from sunrise to sunset and avoid impure thoughts as well as bad behaviour. They break their fast by sharing meals with family and friends, and the end of Ramadan is celebrated with a three-day festival known as Eid al-Fitr, one of Islam’s major holidays. Ramadan is a month in the Islamic calendar dedicated to fasting, as well as a time for physical and spiritual discipline and charity – practices which are believed to bring Muslims closer to God by detaching themselves from worldly pleasures. Fasting is one of the five fundamental principles of Islam and during Ramadan, Muslims refrain from drinking and eating from around five in the morning to around 7.30pm at night (sunrise to sunset). There are certain exceptions to fasting – children; the elderly; those who are ill; women who are pregnant, nursing or menstruating; people who are travelling; athletes who are competing – who can make up the lost days at an appropriate time. 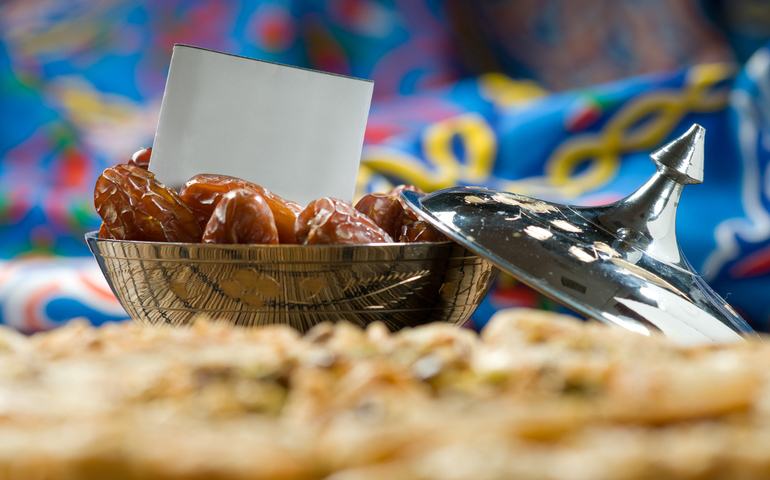 As the sun sets and after evening prayers, the first thing that’s usually eaten is a date as they’re considered a blessed food and are an excellent source of natural sugar. The evening is also when vibrant neighbourhood bazaars come alive, offering an astounding array of local street food. Aside from street bazaars, try the many Ramadan dinner buffet promotions at leading hotels and Malay restaurants, where you’ll find everything from traditional cuisines of the different Malaysian states to Middle Eastern specialties. To commemorate the end of the holy month, Hari Raya Aidilfitri (colloquially known as Raya) is celebrated with new clothing, the act of asking for forgiveness from elders, and collecting duit raya (green packets with money given to children). In Malaysia, the first two days of Hari Raya Aidilfitri are public holidays, but most Muslims take a week off to balik kampung (meaning to return to your hometown). There are usually good airline deals in the weeks before the balik kampung period, so that’s a good time to take advantage and get away! Typically, the first day is reserved for family gatherings and open houses where friends are invited over and all manner of good food and camaraderie is offered. Celebrations last for a whole month and an open house can be held at any time. As with most big festivals, food plays an important role and all Malaysians will be happily indulging in their favourite traditional dishes like ketupat (glutinous rice packed inside a woven palm leaf), beef rendang (beef cooked with coconut milk and Malay spices), satay (skewered grilled meat), lemang (glutinous rice cooked in bamboo tubes), and serunding (dried coconut fried with chilli). You know Ramadan is around the corner when this radio ad begins its run the month before. The whispered “Yusuf Taiyoob” has become an integral part of the pre-Raya buildup. And in case you didn’t know, it’s a brand of dates. The late Sudirman Arshad was a consummate performer loved for his stage shows and evergreen songs. Come Raya, ‘Balik Kampung’ – a song about returning to your hometown for the festive season – will be played everywhere from the radio to the shopping centres. The glutinous rice wrapped in a woven palm leaf is an integral part of the Raya menu and has become a symbol of the festivities. It’s also a popular decoration, and will be seen hanging all over town. The sweet (and sometimes savoury) biscuits are often served at open houses. The few common types include pineapple tarts, kuih makmur (a crumbly biscuit stuffed with ground peanuts), kuih semperit (a soft buttery biscuit) and Almond London (a chocolate-coated biscuit with almonds). Some of the festive greetings you may use to wish a Muslim friend include, “Selamat Hari Raya”, “Salam Aidilfitri” or the Arabic greeting, “Eid Mubarak”.